Frankly, I’m surprised it took me three whole weeks to make bread that contains chocolate. Since my challenge did not specify what *kinds* of breads I’d be making – this was deliberate – I felt I was free to dabble in quick breads almost right away. I’m partial to banana bread especially, for personal reasons. And finding one that includes walnuts and chocolate, too – well, you had me at hello. This is a pretty easy recipe, and yields great results. As always, my comments and adjustments are in blue. Recipe and photos after the jump. 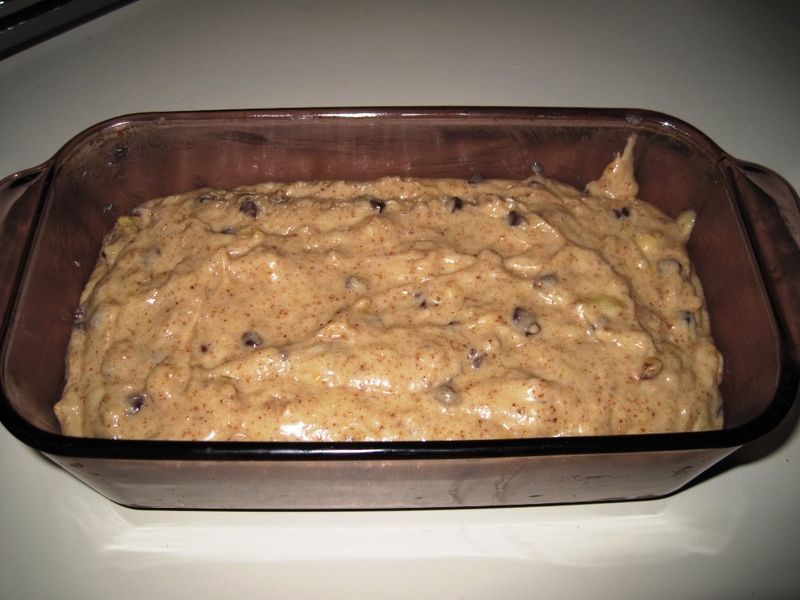 Fold 1/3 cup minichips and nuts into batter; pour batter into a 9 x 5-inch loaf pan coated with cooking spray. 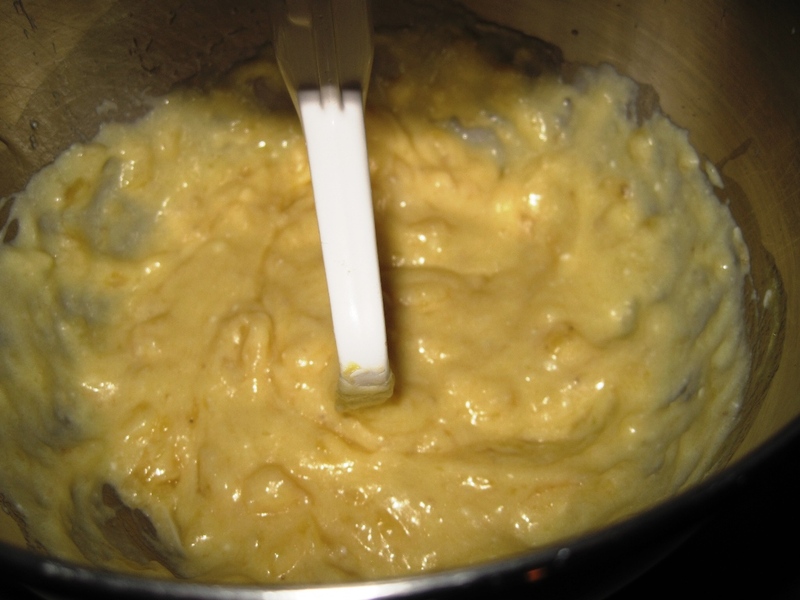 Combine remaining 1/3 cup minichips and milk in a microwave-safe bowl; microwave at HIGH for 30 seconds, stirring until smooth. Drizzle over bread. Everything is better with chocolate. Yes, it is. Pretty much perfect. 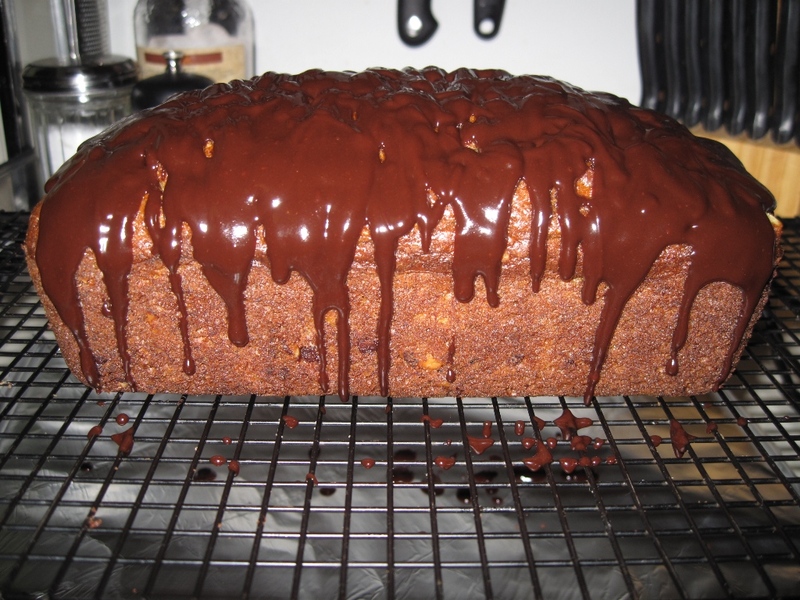 My only issue was with the chocolate glaze – it’s pretty thin, and didn’t harden up like I’d hoped. Its stickiness makes it adhere to the plastic wrap, and then it peels off when you unwrap it. It might be better to thin the chocolate with a teaspoon of shortening instead of milk. A very easy, one-bowl recipe. Unless, like me, you decide to set up your mise en place by dirtying every prep bowl you own. Oh, and did I mention it was absolutely delicious? I will be bringing it to work, because it’s really too dangerous to keep around the house. Next Next post: Last Chance to take the Wendalicious Wine Survey! Looks decadent! Quickbreads are breads, I say. Just barely, though, so watch yourself. Don’t go down that muffin path or you’ll start frosting my cupcakes…. to get you back to yeast.